The Indian Council of Medical Research (ICMR) is conducting a study namely ICMR-INDIAB involving all States and Union Territories – both urban and rural population for ascertaining the exact number of Diabetic patients. 15 States have been covered so far and the prevalence of diabetes varies from 4.3% in Bihar to 13.6% in Chandigarh. According to report published by International Diabetes Federation (IDF; 6th Edition, 2013), number of people with diabetes (20-79 years) in Urban setting of India were about 30.5 millions in 2013. As informed by Indian Council of Medical Research (ICMR), current estimates from one-time cross sectional studies conducted in different regions of country indicate that the prevalence of coronary heart disease (CHD) is between 8-10 percent in urbanand 3 to 4 percent in rural India. As informed by ICMR the estimated prevalence of cancer cases in India during 2013, 2014 and 2015 are 2934314, 3016628 and 3101467 respectively. National Center for Disease Informatics and Research (NCDIR), Bengaluru is running Hospital and Population based Cancer Registries. As informed by ICMR some studies have been conducted on NCDs. A study is commissioned to ICMR on Burden of Non-Communicable Diseases and Associated Risk Factors for India (BOD-NCD). The factors responsible for increase in Lifestyle Diseases (NCDs) are unhealthy diet, lack of physical activity, harmful use of alcohol, overweight, obesity, tobacco use, etc. Public health is a State subject, however, under National Health Mission(NHM), financial and technical support is provided to States/UTs to strengthen their healthcare systems including setting up of / upgradation of public health facilities, based on the requirements posed by the States/UTs in their Programme Implementation Plans (PIPs). Government of India is implementing National Programme for Prevention and Control of Cancer, Diabetes, Cardiovascular Diseases and Stroke (NPCDCS) for interventions up to District level under the National Health Mission. Under NPCDCS, diagnosis and treatment facilities are provided through different levels of healthcare by setting up NCD Clinics in District Hospitals and Community Health Centres (CHCs). Intervention of Chronic Kidney Diseases (CKD) has also been included in NPCDCS for proper management. For early diagnosis, Population-based Screening of common NCDs viz. Diabetes, Hypertension and Common cancers (Oral, Breast, Cervical) is initiated under NHM utilizing the services of the Frontline- workers and Health-workers under existing Primary Healthcare System. This process will also generate awareness on risk factors of common NCDs. Under strengthening of Tertiary Care for Cancer Centre (TCCC) Scheme, Government of India is assisting States to set up / establish State Cancer Institute (SCI) and Tertiary Care Cancer Centres (TCCCs) in different parts of the country. Support under the National Health Mission (NHM) is also being provided to States for provision of dialysis services free of cost to the poor under Pradhanmantri National Dialysis Programme (PNDP). The Central Government, through its hospitals augments the efforts of the State Governments for providing health services in the country. Under Pradhan Mantri Swasthya Suraksha Yojana (PMSSY), 6 new AIIMS have been set up and upgradation of identified medical colleges has been undertaken which will also improve health care facilities. 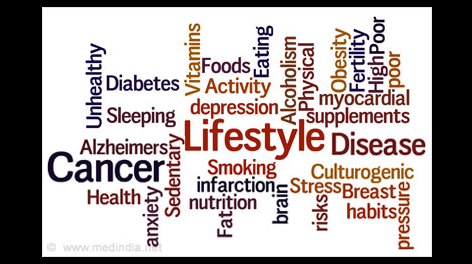 The factors responsible for increase in Lifestyle Diseases (NCDs) are unhealthy diet, lack of physical activity, harmful use of alcohol, overweight, obesity, tobacco use, etc. Government of India is implementing National Programme for Prevention and Control of Cancer, Diabetes, Cardiovascular Diseases and Stroke (NPCDCS) for interventions up to District level under the National Health Mission.